This is the demo of the version that is in the app catalog. It does not allow you to use photo albums on your phone (Like the other free-homebrew-only version) because of a limitation with the current API. Dont worry, as soon as they open that up, we will be combining the functionality of both programs. Switcharoo changes your wallpaper for you. It pulls images from the wallpaper server once a day and updates your wallpaper background automatically based on the settings. You don't have to keep the Switcharoo card open, it will switch automatically in the background. BTW, the image server has well over 1000 fantastic wallpapers for your phone. And we are adding more every day. This demo version is fully functional until Dec 15st. Then it is limited to the last 12 images it had downloaded. 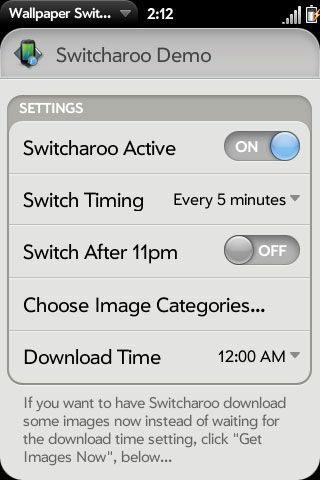 Added an option for 5 minute switching, for all you ADHD's out there that have been asking for it! Changed the limit of images in the Demo version from 10 to 12, after Dec 15th. Fixed an issue where you could click on "Get Images Now" and then close the card, and the images would stop downloading. Now it will continue to get all the images it needs. Now defaults to the just the major categories of Abstract, Architecture, Nature and Textures. The other categories still have great images and can still be picked. But they were more specialize, and so are no longer picked by default. Improved and clarified instructions in various places. Fixed an memory issue with WebOS 1.3.1. Also Changed the expiration to Dec 1st, and set the number of images it was limited to after that to 10. Fixed an issue where the switching would conflict with the downloading and keep the app from getting new images.